If yes, our latest Laser Hair Removal technology, the MeDioStar NeXT PRO, with an integrated skin-cooling system, guarantees the highest levels of comfort available. We offer Laser Hair Removal from our salon in Maidenhead, Berkshire. We are offering discounts and savings across our full range of Laser Hair Removal treatments. This means that our clients can take advantage of the latest technology, the MeDioStar NeXT PRO Laser, to remove their stubborn hair growth and achieve the smooth skin they have always desired. The wavelengths of the high-powered diode laser, the MeDioStar NeXT PRO, were chosen in such a way that the absorption of the light is very high in the melanin, but low in water (an important substance in the skin), therefore providing for a very selective and safe treatment, with a very low risk of any side effects. At the same time, this makes it possible to treat even dark or tanned skin with very low risks of hypopigmentation (loss of skin colour). Using a special SmoothPulse mode makes the laser pulse sensation almost unnoticeable, even for sensitive clients. Why choose Laser hair removal with us? Hair and skin will become less pigmented in the treatment area. Each treatment session is quick and virtually painless. It is important to shave the targeted area beforehand (do not use a hair removal cream). Permanent hair reduction, however, cannot be achieved after just one session. The amount of sessions required for complete permanent hair removal depends on the area to be treated and the individual skin type. During the session, the therapist will work systematically over the area being treated, emitting flashes of light, and a mild sting and some slight heat may be felt. After the treatment, a soothing gel will be applied and it is recommended to continue this regularly at home, together with an SPF30+ sunblock. Later, after the treatment, hair may appear to continue to grow, but it is in fact shedding. This can take from 1-4 weeks and the hair will then fall out and regrow, usually more slowly than normal, softer, finer, lighter and slightly patchy. This is because the hairs which were actively growing while having treatment have been damaged or destroyed. After each treatment, progressively more unwanted hairs are destroyed, with the hair free areas becoming larger and more visible. To achieve long lasting or permanent hair removal it is necessary to destroy the hair follicle from which individual hairs grow. Carefully selected and controlled pulses of light penetrate the epidermis and are absorbed by melanin contained in the hair follicle, making it one of the safest treatments in the aesthetic field. The heat that is transferred to the hair follicle will destroy it, making it unable to produce any new hair. 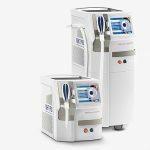 The MeDioStar NeXT PRO Laser hair removal system is suitable for a complete head to toe treatment, available for both men and women. This treatment offers practically painless permanent hair reduction, delivering touchable, soft, smooth skin. One treatment every 4-8 weeks for most of the body, for the face every 3-4 weeks. On average, successful treatment requires between 6 and 8 sessions, but the effort pays off. Numerous clinical studies prove that once successfully removed, laser epilated hair will regrow only very slowly, if at all, and will be very thin. In order to remove this regrowth successfully, it is generally sufficient to repeat a single session once a year. Many factors influence hair growth, e.g. age, ethnicity, metabolism, medication, hormones and genes all play a part. After a free consultation, the therapist will be able to advise you of the realistic expectations. Most adult men and women can have Laser hair removal, it can also be used for children based on an individual consultation, and with the parent’s consent. There is no upper age limit, as long as the hair is not white or grey, as these hair types do not contain any melanin. All areas of the body are suitable, except around the eye, inside the nose or the inner ear. Laser treatment cannot be performed over any area where a tattoo is present. All skin colours/tones are suitable. Are there any risks, does it hurt? Not really, although the treatment sensation will vary from client to client. Any discomfort is momentary and there is no lasting sensation. It is possible that slight crusts can develop on sensitive skin and these must not be manipulated. Additionally, the skin becomes lighter or a hyperpigmentation is caused, but both of these phenomena will disappear by themselves after a short time. In very rare cases, minor scars could develop. Due to the optimum design of the MeDioStar NeXT PRO Laser, side effects of more than slight redness and swelling around dark hair are very rare. How does it work for women with Polycystic Ovaries Syndrome? PCOS is a condition of the ovaries associated with excessive egg production and affects between 10-15% of women of reproductive age. Hair overgrowth is a common side effect of PCOS and because light based treatments do not interfere with medication or surgery, excessive hair growth can be treated at any stage of the medical treatment (with the exception of immediate post-operation where surgery is required). Laser hair removal treatment is effective for women with PCOS but, because unwanted hair growth in women is hormonally driven, until hormonal imbalances are resolved, increased hair growth may continue in spite of hair removal treatments. Where for most women, hair removal may be permanent, for women with PCOS, hair removal is an on-going management technique. However, treatment will significantly reduce the amount of hair present and slow down regrowth. We have formulated our prices to give the best value to the customer whilst realistically considering the number of treatment sessions required. Book any course of 6 sessions and only pay for 5! Book a second treatment area at the same time and receive a further 15% discount on the lowest priced area – that’s 5 sessions for the price of 6 and get a further 15% off! Book a third treatment area at the same time and receive a further 20% discount on the lowest priced area – that’s 5 sessions for the price of 6 and get a further 20% off! If you want more than three areas treated, please get in touch for a personalised offer.